The timing of carnival celebrations is believed to have been introduced by French colonists who held extravagant balls during this time. Meanwhile enslaved Africans would use this opportunity to have their own celebrations, including costumes and mocking the colonists, mostly in secret. After emancipation happened in 1838, these secret celebrations were taken to the streets and enjoyed proudly. Today carnival is enjoyed by locals, Caribbean communities around the world and tourists who travel to Trinidad to experience these vibrant events themselves. Most popular are the main events in the days before Ash Wednesday, especially Jouvert. The latter is derived from the French for daybreak. As the name suggests, the feting begins before sunrise and lasts well into the morning. Around theses fetes there are also multiple competitions, such as for costumes and steelpan bands. 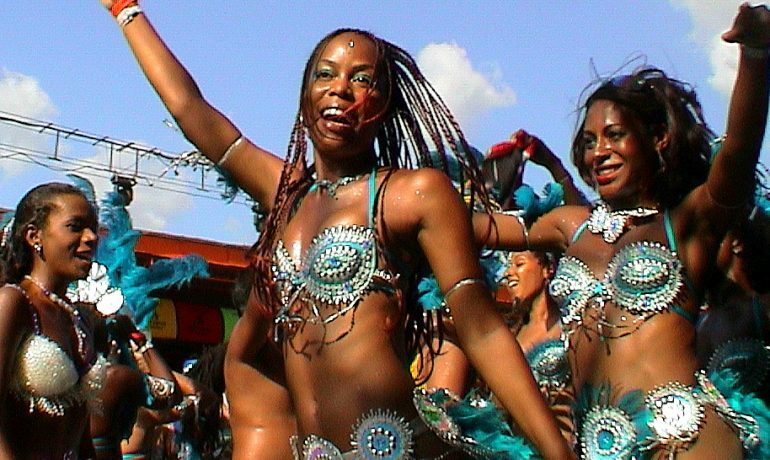 However, there are many more unique aspects to Trinidadian carnival. To join the celebrations in the streets you usually join a bandhouse. The ticket includes food and drinks, as well as most importantly, the beautifully ornate costumes. Each year artists push out new Calypso and Soca songs to compete which ones will be the most popular. There are also specific costumes like the Jab devils and too many other things to try and explain in one blog post. If you want to have a proper Trini carnival experience yourself, it’s best to start planning for next year to go there yourself. We haven’t been there yet ourselves, so we don’t have the words to fully describe these high-energy celebrations. In lieu if, like us, you want to immerse yourself, pretending you’re in the Caribbean sunshine rather than procrastinating leaving the house because of winter temperatures, here are some links.